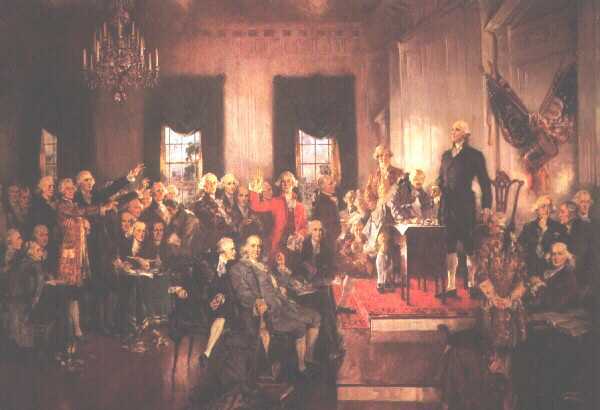 Guide to Understanding and Teaching the Constitution"
Adopted by the Continental Congress on July 4, 1776, its signers pledged their lives, their fortunes and their sacred honor. Written by Thomas Jefferson, it stands as a timeless statement of human liberty, rights and equality. Published September 19, 1796. Prepared with the assistance of Alexander Hamilton and James Madison, it contains all of the true maxims of American Liberty. Abraham Lincoln recommended that the people of the United States read Washington's "immortal Farewell Address" in celebration of the anniversary of the birth of the Father of our Country. (See: Executive Letter, February 19, 1862). Locke's "Second Treatise on Government" and Sidney's "Discourses Concerning Government" were recommended by Thomas Jefferson as containing the "general principles of liberty and the rights of man, in nature and society" and as "those generally approved" by the citizens of the United States (See Minutes of the Board of Visitors, University of Virginia, March 4, 1825). Locke's "Second Treatise on Government"
Titled an Essay Concerning the True Original, Extent and End of Civil Government. First published in 1690 in England. Selections from Sidney's "Discourses Concerning Government"
"The world has so long and so generally sounded the praises of [Sidney's] discourses on government, that it seems superfluous, and even presumptuous, for an individual to add his feeble breath to the gale. They are in truth a rich treasure of republican principles, supported by copious & cogent arguments, and adorned with the finest flowers of science. It is probably the best elementary book of the principles of government, as founded in natural right which has ever been published in any language." (Thomas Jefferson). First published in 1698 in England. Written by the founder of the Institute for American Liberty and published in 1996. Based upon the principles of liberty espoused by the Founding Fathers. Thomas Jefferson:"A Defense of His Character"
Recent DNA evidence has been used to discredit Jefferson's moral character -- A brief history of the original accusations and editorial comments on the evidence and the light in which to judge. The George Washington Center for Constitutional Studies was established to promote civic education in America based on natural law principles and to teach students, teachers, and citizens the basic principles of the Declaration of Independence, of the U.S. Constitution and the teachings and examples of the Founders of the Republic. The Washington, Jefferson & Madison Institute Blog on topics of Liberty, Virtue, Happiness, the Founding and the Constitution, etc. Send your comments or questions to the Institute.